The TV show Shark Tank has been on the air for 8 seasons and I’ve been a fan since the beginning. The premise of the show is entrepreneurs come on with a sales pitch trying to get billionaire investors (known as “The Sharks”) to invest their own money in the business or product. When the business is good, it’s interesting watching The Sharks fight for the deal. However, if the business is bad it’s more fun because The Sharks tear the unpreparedle entrepreneurs apart. In my gay opinion, if you go on a reality show and you don’t know your information then you deserve what you get. Each Shark has their own wheelhouse and personality trait. Kevin O’Leary (self proclaimed “Mr. Wonderful”) is the most ruthless, he’s the Simon Cowell of The Tank. Mark Cuban is the owner of a basketball team and tech guy who tries to come across as down to Earth but fails. Robert Herjavec is also a tech guy and appears to be the most fun to work with. Daymond John is the fashion guy and his stories about growing up in the hood are hysterical. Lori Greiner is the “Queen Of QVC” who’s bought into her own hype. While Barbara Cocoran is a real estate diva who is no shark, she’s a cougar, going after the hot young male entrepreneurs. Barbara is obviously my favorite. After all these years of hearing about different businesses and products, finally in the 19th episode of this season, I found a product that I wanted to buy. Two brothers created a business called Rareform in which they take old vinyl billboards and recycle them into backpacks, totes, surfboard bags, phone accessories and wallets. I’ve been in need of a new wallet for a while but I’ve been too lazy to actually look into buying one. 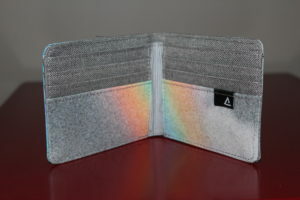 Since I won’t buy animal products, it’s not easy finding non-leather wallets. When I heard the story of these recycled wallets, I knew I had to have one. 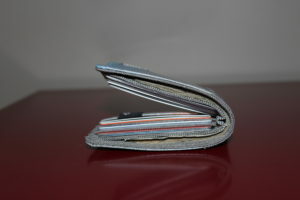 Due to the popularity of Shark Tank, the prices went up and the selection went down, but I was still able to find a wallet I liked. 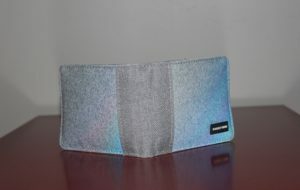 After my purchase, I received an email saying due to the overwhelming demand shipping might take longer than usual but I still had my new wallet within days. The wallet was $32 but with an online 20% discount and shipping it cost just under that. It’s exactly as it appeared online with a slot to hold bills and 6 slots to hold up to 12 cards. Since every store seems to have a loyalty card these days, I was able to fit the 18 cards I had. In the beginning, the cards weren’t easy to remove (maybe that’s why you shouldn’t cram in so many) but as it gets broken in it’s becoming easier. I’ve been using the wallet for a little over a week and it’s working out well. Only time will tell how durable it is but as of now I’m happy with it. For me, it’s all about being able to support a company that’s keeping trash out of our landfills while creating cool one-of-a-kind items.